Along with being well-organized and professionally produced, there’s much viable inspiration and practical advice between these attractively designed covers. Sections focus on topics such as thinking, leading and acting, with chapters on “Ego” “Authenticity” “Substance” “Risk” and more. Well thought-out historical perspectives and personal views are interwoven with interpretation of relevant snippets of writing by authors ranging from Shakespeare to Confucius to Marge Piercy. And for those who might want to sidestep the sometimes-uncomfortable process of implementing change, each chapter ends with brief, intriguing “Think About It/ Talk About It/ Act on It” nuggets, consisting of advice, suggestions, and probing questions (“What is your vision for your life?” “Where can you do better?”). A much-published educator, speaker and coach, Bhalla is both passionate and knowledgeable, which makes for compelling and, at moments, deeply insightful reading. For example, in the chapter “Perspective,” he advises readers to “accept most things once they are 95% perfect,” because, let’s face it, nothing is ever totally perfect. Some readers may feel let down by the author’s later section, “Beyond the Leader’s World,” which encourages readers to engage in sustainable development and other socially conscious actions. While Bhalla acknowledges the “pull of the profit motive,” the terms in which he couches his message lack the fierceness needed to convince a die-hard bottom liner to at least seriously consider, for example, the reality of industry-instigated global warming, as evidenced by research from NASA and other scientific entities. That aside, this book delivers plentiful inspiration and insights. 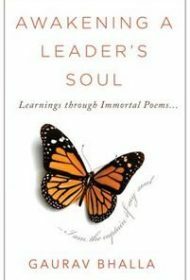 It will appeal to anyone looking to transform the world through thoughtful, soul-oriented leadership.